Harvick raced into the top-10 by Lap 2. Harvick brought the No. 98 FIELDS Ford to pit road under caution on lap 18 for four tires, fuel and adjustments, but an issue on pit road caused the team to drop to the 29th position following the stop. The No. 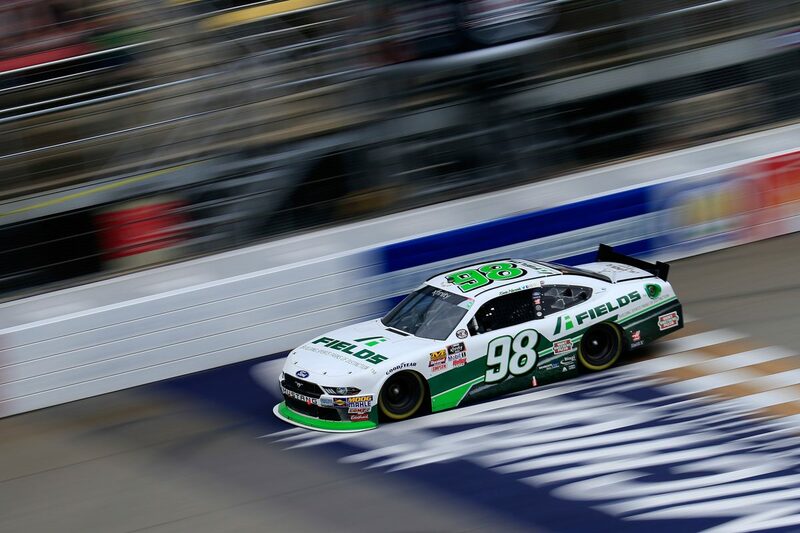 98 FIELDS Ford raced back up to the 10th position by the end of the stage. The team stayed out at the conclusion of the stage to take the lead. The No. 98 FIELDS team stayed out under caution on lap 38 and lap 45. Harvick raced the No. 98 FIELDS Ford to the lead following the Lap 50 restart. The No. 98 team surrendered the lead to come to pit road on lap 57 for four tires and fuel. Harvick restarted 25th with one lap remaining in the stage and gained four positions in the final lap of the stage. Harvick raced the FIELDS Ford from 18th up to the 10th position by a caution on Lap 67. On the restart, Harvick raced up to the fifth position, before being hung out and dropping to 10th by a caution on Lap 72. Harvick restarted eighth in the FIELDS Ford on Lap 75 and raced up to seventh by the next caution on Lap 80. Harvick and the No. 98 FIELDS team were racing in the eighth position when the rain came and ended the event. Harvick scored his second top-10 finish of the season. Harvick led twice for a total of 11 laps. Harvick’s SHR teammate Cole Custer finished third. This was Harvick’s third NASCAR Xfinity Series start of the year for Stewart-Haas Racing with Biagi-DenBeste. Harvick’s next appearance in the No. 98 Ford Mustang is schedule for Chicagoland Speedway in Joliet, Illinois on June 30. Austin Dillon of Richard Childress Racing won the rain-shortened LTi Printing 250 at Michigan. Only 30 of the 40 cars entered into the race finished on the lead lap. The race featured 16 lead changes among nine leaders and 10 caution for a total of 37 laps.